The All Progressives Congress (APC) are said to still be considering their options for the vice presidential position alongside General Muhammadu Buhari. Contrary to media reports that Buhari had picked party chairman, Bola Tinubu, as his running mate, he only agreed to allow Tinubu select at least three candidates with the final selection being made by the party. As of this morning, Buhari's options for running mate had been narrowed down to Governor Oshiomhole and former Lagos State Attorney General and a Pastor of the Redeemed Church of God (RCCG), Prof. Yemi Osibajo. ...consideration for the two men came only after the former Lagos State governor, Tinubu had agreed to drop his ambition to run with Buhari. It was learnt that pressure was mounted on Tinubu to drop his interest following wide-spread concern against the fielding of a Muslim-Muslim ticket, especially considering the mood of the nation. Tinubu is said to prefer Osibajo because of his relatively good character as well as respect in the Christian community. 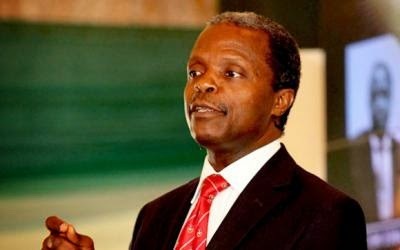 Osibajo served as attorney general and commissioner for justice during Tinubu’s tenure as Lagos State governor, and is a senior pastor in the Redeemed Christian Church of God, currently head pastor at the Banana Island Parish. Pastor Prof Osibajo, as he's called in some quarters, is said to be close to Pastor Enoch Adeboye, the general overseer of the RCCG. Some earlier reports have it that General Muhammadu Buhari, when presented with the two candidates, Oshiomhole and Osibajo, picked the latter as his vice presidential running mate. This believed to balance any insinuation on the country sliding towards an Islamic path as some of his critics have claimed. Buhari picked Osibajo ahead of other names, including governor of Rivers State, Rotimi Amaechi and Governor Adams Oshimhole of Edo State, as well as former Ekiti State governor, Kayode Fayemi. They said the only step left was for Osibajio to be ratified by party leaders, especially those from the South West West who are meeting to take a final decision on the issue. Tinubu first picked Osibajo but because of the insistence by the APC governors that Buhari's running should be chosen from amongst them, he later on settled for Oshiomhole, who beside being a serving governor, is considered to have greater electoral value than the little-known Osibajo. ...barring any last minute switch in choice, Oshiomhole will be formally presented to a meeting of party leaders in Abuja Monday. The party's position came just as all indications point to the emergence of a south- south vice presidential candidate in the person of Edo State Governor, Adams Oshiomhole.